Ever wonder what the competition is doing with their Facebook ads? Why not scroll through your Facebook newsfeed and get some competitor research done at the same time. It’s surprisingly both easy and revealing. 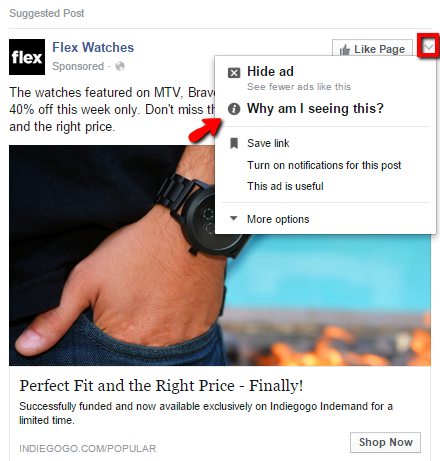 It’ll even give you some insight on how Facebook’s different targeting options really work. Scroll until you see the small grey “Sponsored” text next to a profile pic. Click on the little drop down arrow at the far right of the post. Hit the info icon with a “why am I seeing this” description. In this case Flex Watches thinks I’m a good bet to weigh down my wrist because I showed interest in one of their competitors. You can bet that Flex is using a strategy of targeting people who are interested in some of their major competitors, in this case mvmt. Whether this is a good idea is debateable, I may have already bought a watch from mvmt or I didn’t like what they had to offer and am looking for a different piece. Flex likely has their answer by now! But just by clicking this option I can see a clear example of a company testing out interest targeting. And not only interest targeting, but competitor targeting. The following are some ways companies are targeting their audience on Facebook. This will be especially useful if you could be a customer of your business. If you’re not in your customer target demographic, you might want to borrow a phone of a friend who is to see what your competition is up to, and that friend is going to have to trust you. Facebook will tell you more than one way of how an ad is targeted. It’s possible to see age, gender, interests and more. They know a precise interest to target. Here age and location are targeted, and it tells us how Facebook uses the information from my profile and how, or where, I connect to the social media platform. Some advertisers are going after people based on their level of education. If this looks like something you’d like to try – keep in mind that this is self reported information and may not be accurate, you don’t have to upload your doctoral thesis to say you’re a doctor on Facebook. Facebook’s lookalike audiences are a great tool. You give Facebook a list of people and they combine some rediculous number of data points (between 1,000 & 10,000 depending on who you listen to) and give you the top 1% (or more) of the target country’s population that are similar to your list. It’s always seemed a bit vague. Ever wonder if you fit into the category of one of Facebook’s Lookalike Audiences? You can find out! This simple description reveals that I’m part of at least one of Facebook’s audiences. I’d expect that Kent & Lime have uploaded a customer email list and created a lookalike audience. It seems like Kent & Lime aren’t using any layering like gender or age to refine their targeting. Or Facebook doesn’t give us the whole story. However, this ad from IQ option tells me that they are adding some layers to their lookalike Audience. Depending on the industry the Friends of Friends targeting option is fantastic – although you might want to think twice if you’re in B2B! If you’re marketing for an industry that has widespread general appeal, like clothing, this is definitely an approach worth testing. Facebook will let you upload an email list. A great way to keep a large customer base coming back to your site is hitting them on social media. No surprise that Amazon.com uses this technique to keep their customers (not just traffic) coming back to their website. The most powerful tool in any digital marketing is remarketing – showing ads to people who have been on your site, to bring them back to complete a desired goal. If you’re looking to learn more about remarketing – check out this guest blog that Mike Rhodes wrote for Digital Marketer, and enjoy their remarketing ads! There’s also 3rd party tools that offer dynamic remarking, like AdRoll or in this case – Criteo. These ads will show you an image of a product or similar product you viewed, or added to a cart, on an e-commerce store. While you may see what your competition is doing – it may not always be the wisest move to do what their doing. You may notice that they have a bit of a poor strategy and you can just let them continue spending money in that fashion. If you see something that looks like a great idea, feel free to test it! Hopefully a trip through your newsfeed will provide new targeting inspiration. You’ll only be able to get a little bit of information, not the whole picture. But even this little bit of a glimpse into the strategy of the other guys could be a leg up! …If you spend the next several weeks clicking on “why am I seeing this” in your newsfeed.